The die cast aluminum heat sink has 12 heat dissipating fins to maintain a cool operating LED for maximum life. The fins are independently supported to allow for unobstructed airflow. The fixture is designed to efficiently perform in any mounting orientation. A cathodic epoxy electrocoat primer or E-Coat is applied to all die cast aluminum components. E-coating provides the ultimate in corrosion and chemical resistance, providing superior salt spray, humidity and cyclic corrosion endurance. After the E-Coat is applied a super durable polyester powder coat finish is electrostatically applied in our state of the art paint facility. Standard colors available: Black, Bronze, OD Green, White. Custom colors available upon request. Techlight’s proprietary OpticapSystem™ utilizes interchangeable optical lenses & reflectors to increase fixture lumen output efficiency. The system is provided with a high performance convex lenticular prismatic flood or a plano-convex spot optical lens. The flood & spot optical lenses are molded from low iron tempered glass. A 96% reflective UV stabilized injection molded reflector is included with each system. The OpticapSystem utilizes field interchangeable shields designed for optimum glare control in up or downlighting positions. The shields are field rotatable to allow adjustment of shielding. A variety of glass color filters are available to meet the designers specific color control needs. Fixture operates at 9-16VAC or 9-24VDC input voltage. 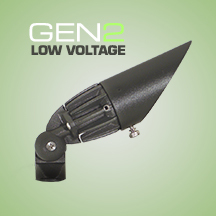 A 13 watt LED source provides approximately 645 (CW) Lumens of light.